I had a blast visiting New Orleans recently. I was fortunate to be with locals who knew where to go for the best food and drink and they were also willing to humor my inner garden nerd. My peeps live in Metairie, Louisiana, which is just outside New Orleans. They live in a lovely brick home in a nice neighborhood. The Neighbor's House! She loved cutesie garden ornaments. Metairie was not flooded during Katrina. The 17th canal that separates Metairie and New Orleans broke into the New Orleans side and flooded 75% of New Orleans. Metairie sustained a lot of wind damage and water damage from that but was overall in good shape comparatively. The neighborhood was modest but lovely. Seems like most of the neighbors were not gardeners. But in general homes seem to have less landscaping. I'm sure it's the heat and the humidity. The average high hemp is 80 degrees and the low 61 degrees. Bugs could also be the reason for keeping plantings away from homes. 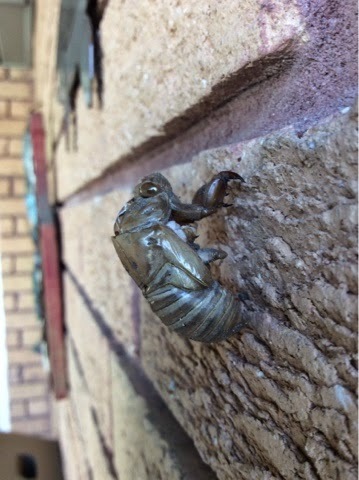 There were still cicada skins clinging to the brick at the back of the house. So i can see how gardening in the summer could be trying. Unless I had a 72 oz frozen daiquiri from the Fat Tues Day, I wouldn't want to be out there either! While walking their two dogs, I got a glimpse of the plants in people's yards and while there were some Portland plants, it was decidedly a lot more tropical, as would be expected. I was tickled to see all manner of Palm, Amaryllis as bedding plants, roses, lots of sun annuals and a few other random plants. Lots of Amaryllis - Sure beats Geraniums! Once one of the neighbors found out I was a gardener she was asking me what to do with the 50 count bag of tulips she got for retirement. I have never gardened in a tropical-ish environment, so I wasn't really sure what to tell her?!? I hope to post some of the more garden related aspects of my trip, but I also got to help prepare a traditional crawfish boil, so there may be a post about that too! And there will be alligators! Oh, those amaryllis are lovely...such bold color..they make a statement all by themselves. Looking forward to more posts about your trip!